Ollie Wain has been working with us for the past few months on a placement during his summer break at University. I am a second-year product design student at York St John University. For the past few months I have been working with the Fluxaxis team to broaden my knowledge within the additive manufacturing industry. I have my own 3D printer at home which is a simple FDM setup, so was interested in learning more. How did you hear about Fluxaxis? A fellow design student and recent graduate recommended that I contact the Fluxaxis team to arrange a work placement due to my persistent interest with 3D printing. My future ambitions are to take my design knowledge into a consultancy company where I can develop my skills further and produce meaningful products. The time I have spent learning and working with the team will benefit me greatly, the more common 3D printing is becoming as a strong means for prototyping and for manufacture, the more designers will need to learn to design for this industry. These past weeks have taught me the level of attention to detail, accuracy and quality that is required to compete in an ever-changing industry. What have you enjoyed most about your time with Fluxaxis? The vibrancy and energy of the Stage One and Fluxaxis teams really made my placement so much more enjoyable. I have never experienced such family spirit from a workplace and it positively shows in the work produced – essential in a creative atmosphere. I have made some great contacts and gained indispensable knowledge. Working on projects for design clients has really opened my eyes to the future of prototyping and production. 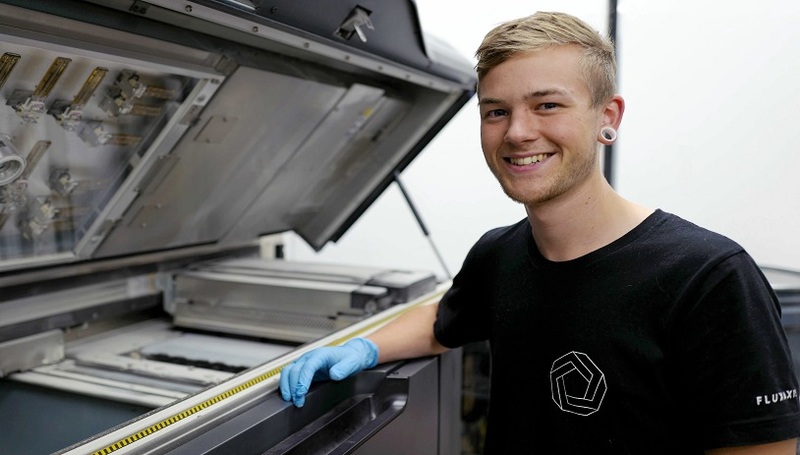 The vast amount of printing knowledge that is required to create brilliant prints was a bit intimidating to begin with, but Simon and Jake were keen to teach me what they knew and answered any questions I had about the processes. All in all, I have thoroughly enjoyed working at Fluxaxis and can’t wait to see what projects they work on in the future. We wish Ollie all the best for the future and thank him for his time with us, he’s been an asset to the team!